You have 3687 characters. Don’t forget to add important and relevant keywords in your description to improve your iTunes app page and optimize your SEO. Your app's last version was released on June 02, 2017. It is important to regularly update your app. Best practices recommend to update your app every 4 to 6 weeks. This means fixing reported bugs, improving existing features, launching new features etc. Keep an eye on users' feedback. The next great features may already be asked by many users. Quit smoking and stay quit with new My Last Cigarette for iOS, the original quit smoking software. Since 1999 My Last Cigarette has successfully helped 1000s of ex smokers stay quit. If you are serious about staying quit then this app could make all the difference! MY LAST CIGARETTE WORKS ! Simply enter your smoking habit and personal details then watch as various indicators display your expected increase in lifespan, your circulatory and lung function improvements, your savings, and much more. Over 10 different readouts keep you informed and motivated. 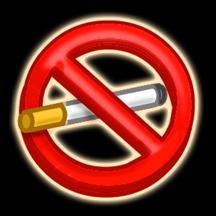 My Last Cigarette for iOS is a proven aid to help you resist restarting this fatal addiction. It is a serious tool that benefits from years of medical research into the harmful effects of smoking. By showing you the behind the scenes improvements in your health your will power will be increased and your resolve strengthened from day one. Be sure to check out the testimonials. Statistics are updated in real time, every second! All calculations are based upon the latest medical knowledge and statistics. Daily motivational quote or medical fact. Readouts updated every second and are based upon your own personal past smoking habits. Universal App designed for iPhone, iPad and iPod Touch. No need to purchase twice. My Last Cigarette has helped 1000s of users successfully resist restarting smoking. If you are serious about staying quit then My Last Cigarette could make all the difference. "I have tried smoking numerous times and never stuck with it. I purchased this program and was really surprised at how having the ability to visualize your progress really helps keep you motivated to quit smoking. I have not had a cigarette in 90 days and actually have no desire at all to light up. I think this program is a great tool to help you quit." "It won't do all the hard work for you but it can give you a big helping hand when the craving starts. Just look at the graphs and imagine having to go back to square one. Havn't smoked a cigarette since 19th April 2002 after being a smoker for twenty years." "It really helped me personally to graphicaly see what was happening inside my body and all the other information has only helped strengthened my resolve. I haven't picked up a cigarette since I got it." "Didnt knew if it was the knowledge of my cc being billed for the app or what but i have no smoked since i bought it it helps a lot to see graphically how your health is. COOL!" I've tried various methods to stop smoking over the last 40 years. Started when I was 11 years old now 52. I now feel I can say I?m a non-smoker. It's all down to "My Last Cigarette" Every morning I turn on my PDA to have a look how many cigarettes I've not smoked. That sets me up for another day without one. If this government is serious about reducing the number of smokers it should by this software and give free on the National Health. In my Lifetime I've smoked 433590 cigarettes but more importantly I've not smoke 4043 since I stopped on July 27th this year. Do yourself a favour buy this software."